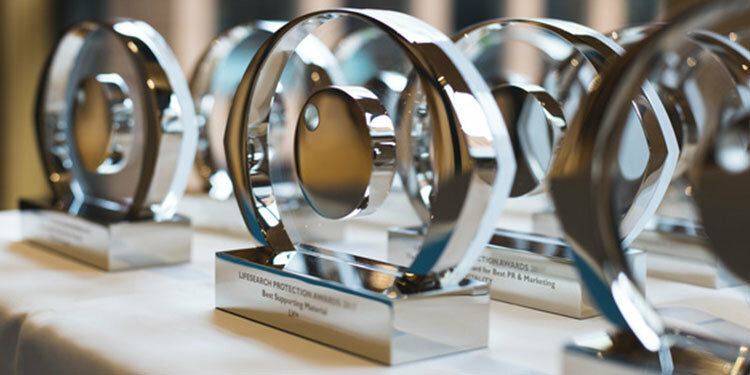 The LifeSearch Protection Awards, otherwise known as the ‘eye’ awards, have been manufactured each year by Special EFX since 2006. That is a significant length of time for a client-customer relationship and the trophies are a ‘familiar face’ to many at EFX. So, what are the most important factors for a company such as LifeSearch, highly successful and respected as the UK’s biggest insurance broker, when it comes to choosing a supplier for its much-coveted trophies? The LifeSearch ‘eye’ design is expertly produced in a mirror-finished, polished nickel-plated aluminium, set off against a clear acrylic back. The motif has been the company’s logo for many years and is well-known in the financial services sector. It signifies the rigorous search process the company undertakes on behalf of all its customers, when recommending relevant products and insurance. The LifeSearch Protection Awards took place March 7, as part of the company’s 21st Birthday Ball, which was held at the Banking Hall, in the City of London. On the night, AIG Life was named the winner of three of the Award categories, including Outstanding Insurer of the Year 2019.